The San Bernardino County Sheriff’s Department is having its first Cars and Stars Car Show to benefit the Sheriff’s Employee Assistance Team and the Debbie Chisholm Memorial Foundation, which grants wishes to catastrophically ill children in the Inland Empire. The event will take place from 9 a.m. to 4 p.m. on April 4 at the Auto Club Speedway, 9300 Cherry Avenue, Fontana. 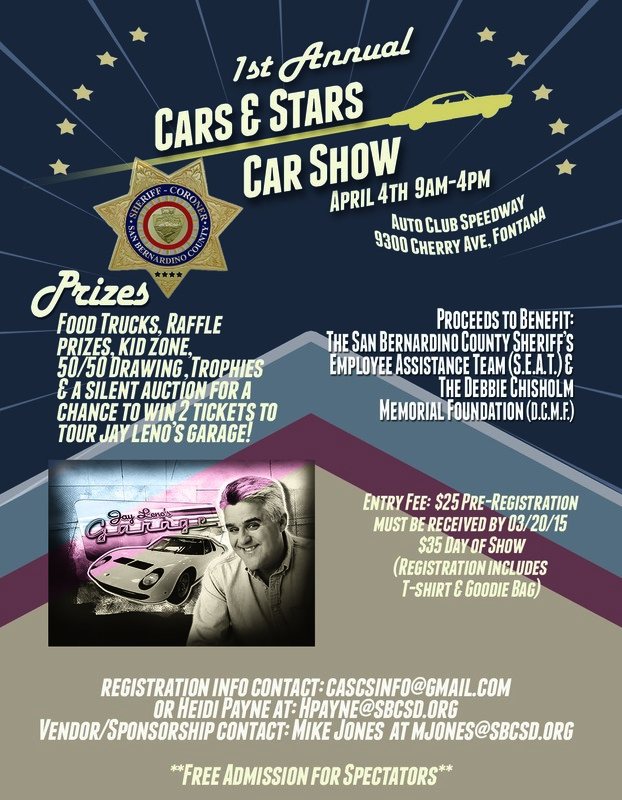 There will be prizes, food trucks, a 50/50 drawing, a kids zone, trophies and a silent auction for a chance to win two tickets to tour Jay Leno’s garage. The entry fee is now only $25 for those who pre-register their vehicles before March 20. Registration on the day of the show will increase to $35. Registration includes a T-shirt and goodie bag. Admission is free for spectators! For questions about registration, contact cascsinfo@gmail.com or Heidi Payne at hpayne@sbcsd.org. For more information or sponsor and vendor opportunities, contact Marc Summers at msummers@sbcsd.org or Mike Jones at mjones@sbcsd.org. Am I still able to register for the car show tonight on line or should I wait and register at show on April 4? If you email cascsinfo@gmail.com you will be sent a registration form and you can pay through Paypal online and receive the pre-registration price of $25. If you pay the day of the event it will be $35.